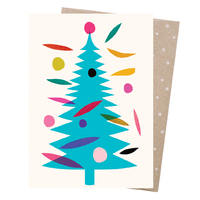 Part proceeds from the sale of this card will be donated to Trees For Life. Trees For Life grow around 800,000 seedlings every year for land restoration and habitat creation and protect over 3800 ha of native bushland. Earth Greetings cards are made in Australia from 100% post-consumer recycled paper and printed carbon neutral with vegetable based ink. Card size is 155 x 110. It's blank inside and comes with a natural, 100% post-consumer waste envelope. The cards are suitable to be printed on the inside with your logo and message. Please ask if you would like us to assist you by obtaining a quote from a digital printer who is experienced with our cards. Please ask us about bulk discount for corporate orders over $200 value.